March has finally arrived and I am definitely ready to let some sunshine in. You just never know how long it will last up here this time of year. I know it has been a long winter for many of you as well. We have moved a few times in the last several years, and because of that we have done quite a bit of downsizing. We are finally settled and since we bought our home a few years ago I am more than ready to buy some new furniture. But in the meantime, funds are rather tight so I am using what I have and making it work for now. Our kitchen and dining area is quite small and because of that I have had to get creative with our dining room area. 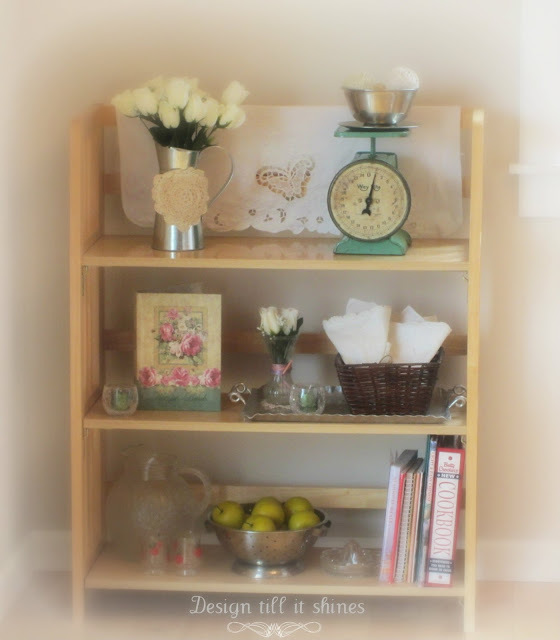 Our large dining set and buffet would not fit or even go well in this small space, so I am currently using a small bookshelf as a baker's rack because it goes with my butcher block dining table. I am learning to enjoy the simplicity and I feel I am somewhat of a minimalist decorator anyway. I love the sweet simple look of the farmhouse style. It reminds me so much of my grandparent's home and their farm. It was always so charming, tidy and simply decorated with farmhouse goodness. 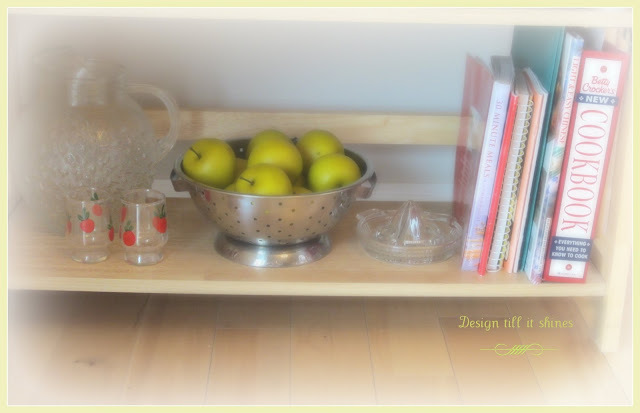 They had so many vintage things that I would love to have now, so I am recreating some of their style in our home. There are some lovely farmhouse blogs that I enjoy as well and they remind me so much of days past, so I am continually being inspired. 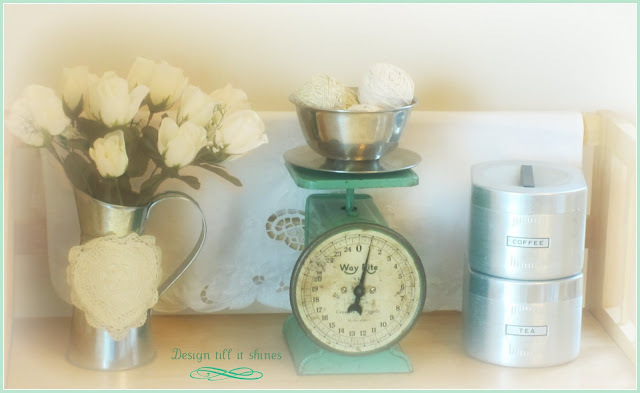 I have always loved the scales I have seen all over blogland and when hubs and I went antiquing awhile back I spotted this green scale. It's a little more rusty and worn than I usually like but it is green. And I love green so I had to buy it. I added a silver bowl with some cotton yarn. The metal canisters from the 50's were in my mom's kitchen. The lacy vintage towel is actually an apron folded over that I thought would add a vintage touch. I filled the rest of the shelves with some items I already had. I am always tweaking my photos, softening them for a more vintage feel. 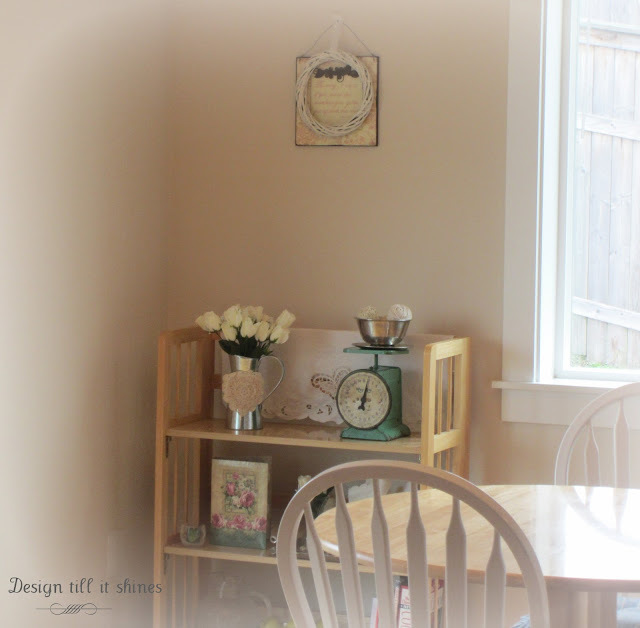 As I mentioned, our dining and kitchen area is quite small and I'll share more on that in a later post. We have the great room concept on our lower level, which in our case isn't that great because our kitchen area is too small to be practical really. Since there are only two of us now, we're making it work and we love our open outdoor space behind our house. So there are always trade offs when you lose some interior space, but you gain a lovely open view. New curtains are coming that will go better in our dining area and living room. The kitchen area looks so bare without curtains! Even though the sign above the bookshelf is quite small, I really like it here since it looks so vintage. I need to keep a minimalist approach in mind or the space will look too cluttered. I opened the blinds for more light but there still wasn't enough on this overcast day. I don't think Dolly Parton originated this quote, but she certainly gave it her own charming southern spin. I found this a few years back at Cracker Barrel and love the rusty flowers and the simple wire hanger. This quote really applies to this region as well. We get so much rain here but it keeps everything green and there is always that occasional rainbow to lift our spirits! I added a white lacy wreath to this pic. I love fresh flowers but I didn't have time to get any so faux roses will have to do. I love the sweet lacy butterfly. 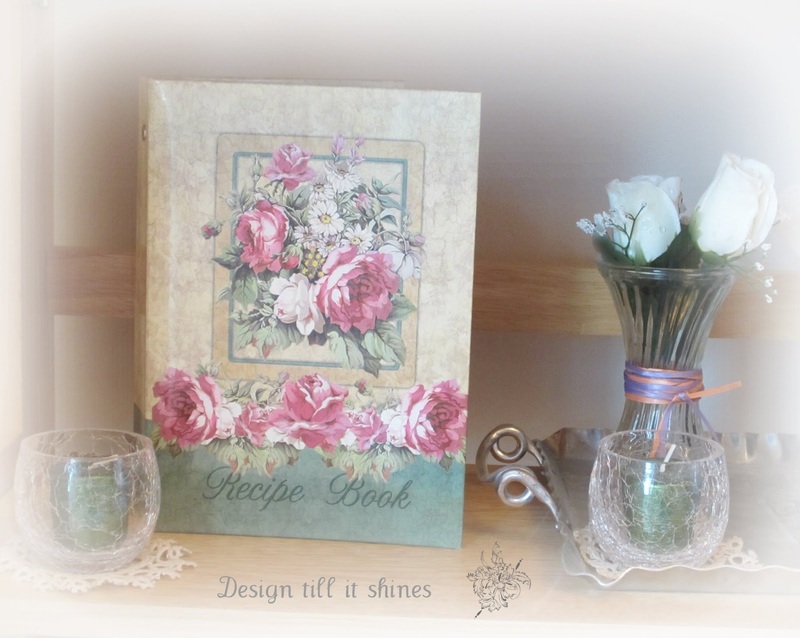 I've had this recipe book forever it seems, and thought it would look pretty here. Even though I cook all the time, I have never added a recipe to this book. I always thought it was too pretty to write in. It has a soft watercolor look to the pages. 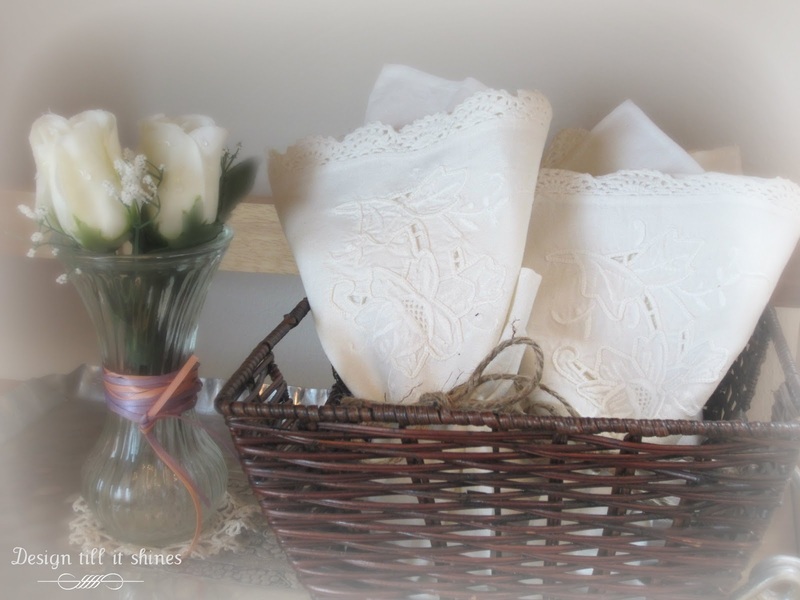 Vintage lace hankies always look so pretty in a basket. I have some of my cookbooks on the bottom shelf out of necessity really, since my kitchen doesn't have enough storage. I have lots of glassware, but I only have room for a few pieces here. I also have all kinds of collectible things in boxes and there is simply no room to display them now. I look forward to the day when I will find the right farmhouse style hutch and dining set that will really set off this dining area. In the meantime, I am learning to work with what I have and be happy with it. Decorating simply with things that have a special meaning to you never goes out of style. Thanks for stopping by! Looks wonderful and I love your scale! Oh I am so in love with scales. I just love the color of yours. 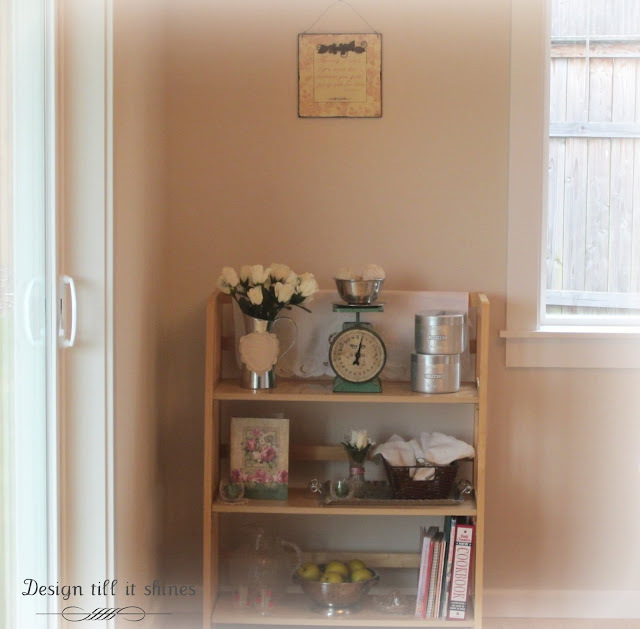 I love your idea of decorating with what you have and be happy with it!!! This shelf is such a precious display of lovely vignettes!!! Ten years ago, "Mr. Ed" & I left the "Dream House" behind to move near our son. While it was a difficult move in material ways, the benefits of having our family together outweighs all the compromises of our 1970's Ranch Style Home!!! Family is truly all that matters in life...combined with friendships! Thank you for sharing your kitchen...and your home! 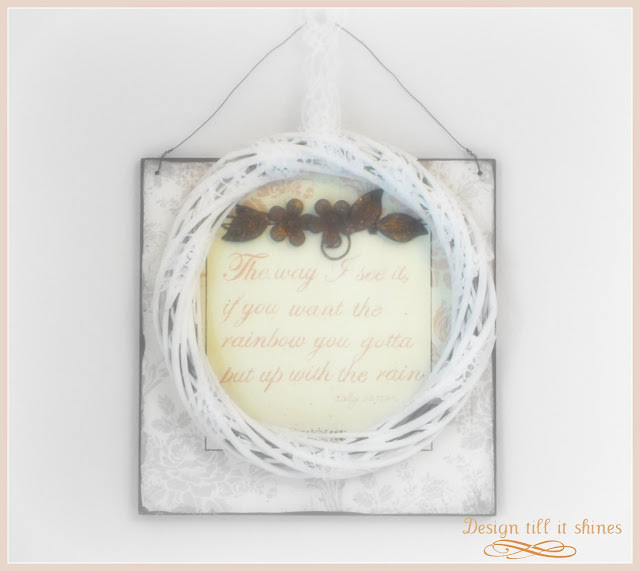 I love decorating with items with meaning too. Very nice farmhouse display. 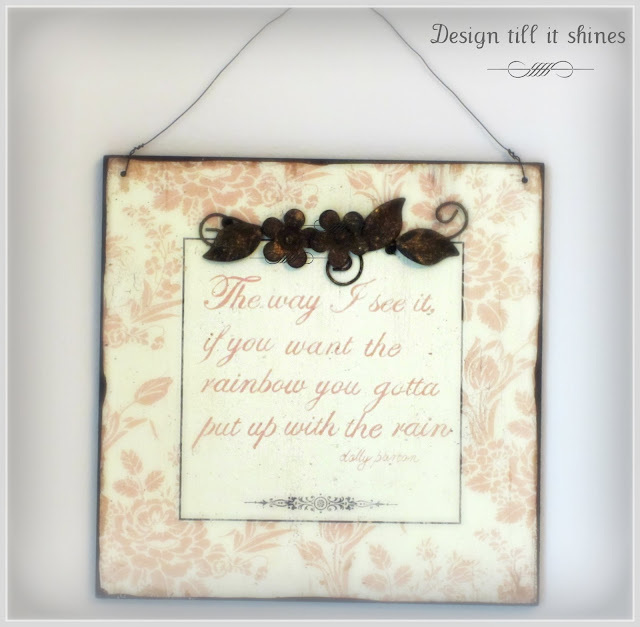 You are absolutely right...decorating simply with things that have meaning for you! Love your mother's canisters. I appreciate the sweet comment about my canisters. Thanks for stopping by! Beautiful vignette Diane. I love the scale and its always better to use things that have special meaning to you. Thanks for linking up at Transformed Tuesday. Repurpose, Reuse, and Redecorate with what you have. Great idea, you do a wonderful job. Be sure to pass on the stories and history of the items you love. They become the family's treasures. Thanks for stopping by and leaving such lovely comments! I loved both looking and reading this post. Everything is so sweet and simple. Just like a vintage farmhouse. Everything looks so pretty. A perfect place to so different little vignettes. thank you for sharing at TTF. Very pretty-- from one Diane to another! What a pretty nook filled with so many great treasures! That little aqua scale has me swooning! You shelf is very pretty. The hankies are lovely. I wonder if my middle school students even know what a hankie is? Hi Diane, so happy to have you join in on Share Your Cup. I love vintage scales. They are one thing that I just can't pass up. Love the color and your vignette is lovely. I read your intro and found that we have so much in common. Happy to be following you. Hope you will share again this week! It all looks so pretty,love all the little touches that add up to a big wow. 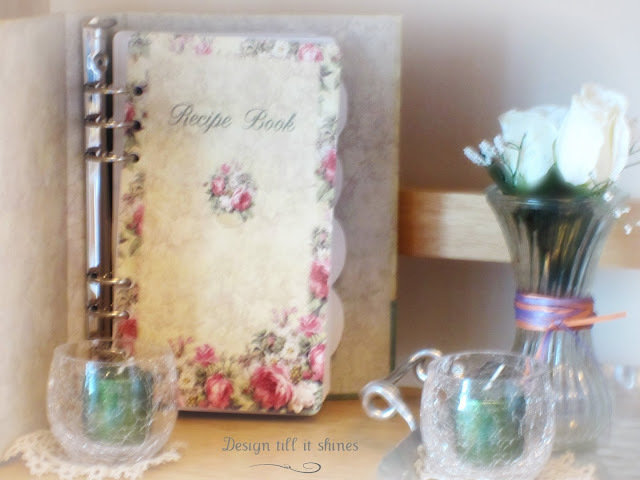 Hopping back to say that I am featuring you on Share Your Cup. Lovely photos and vignettes. Thanks for linking up at Shabbilicious Friday this week. What a great scale! Very pretty! 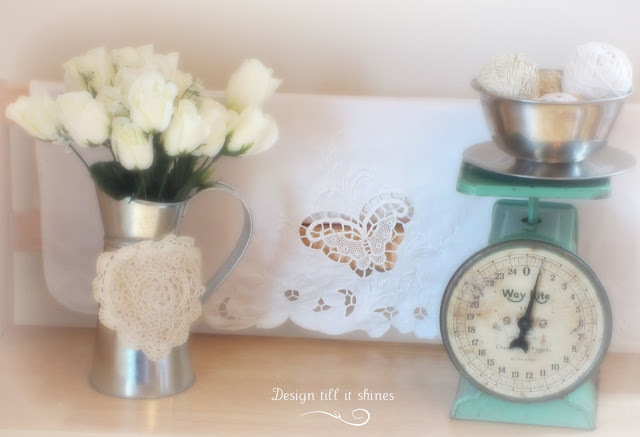 Very pretty vignette...and I love that old scale!! Happy Country Whites Weekend! Thank you kindly for embracing your country whites and sharing at the party. My fave is the little white apron...so sweet! That scale looks a lot like the one I have in my kitchen! Thank you for joining Country Whites Weekend! We have some wonderful posts and yours was certainly one of them! Be sure and check back this Friday for the features! Very pretty! I'm a new follower!